The main cause of income inequality is educational disparities, although its importance has declined over time. Income gaps between population groups that differ by sector (Jews/Arabs), residential location and number of children in the family have grown over time. Dividing the population into groups by household characteristics explains only some 20 percent of the total income disparity. That is, most of the income inequality stems from differences in income between individuals with similar characteristics. “Income inequality in Israel has been on the rise for the past 30 years and today is among the highest within the OECD countries. In previous decades the increase in inequality stemmed primarily from market forces, while in the past decade it is a result of government policy and in particular cutbacks in social allowances and a lowering of direct tax rates.” This is according to Prof. Ayal Kimhi, Deputy Director of the Taub Center and an economist in the Department of Agricultural Economics at the Hebrew University. Prof. Kimhi will present his new research on this subject at the annual conference of the Israeli Economic Association on Tuesday, June 4, 2013. The study by the Taub Center indicates that in the 1980s and 1990s inequalities in net income grew at a more moderate level than gross income inequality. This indicates that in the same period government policy had a partial success in controlling the widening of economic gaps. In the first half of the last decade, on the other hand, gross income inequality declined while net income inequality grew at an accelerated rate. In 2009, net income inequality in Israel was amongst the highest in the OECD countries after Chile, Mexico, Turkey, and the United States. 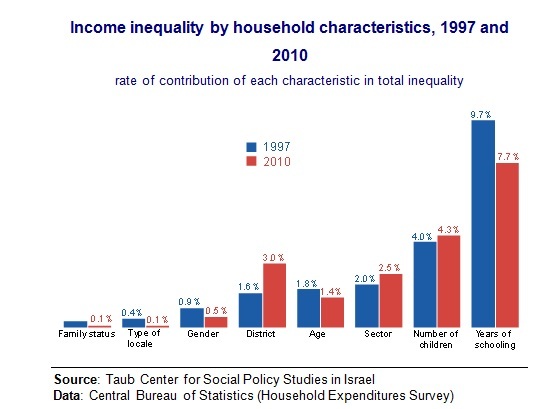 Prof. Kimhi, in a joint work with Michal Shafir-Tidhar from Ben-Gurion University, examined the level of inequality by different characteristics of the household and of the head of household (that is, of the individual who contributed the most income in the household) for the years 1997 and 2010. As can be seen in the figure, the greatest contribution to inequality is related to the number of years of schooling of the head of household. Nevertheless, this factor explains less than 10 percent of the total inequality in 1997 and less than 8 percent in 2010. Factors that contributed less to the inequality were residential location, age of head of household, sector (Jewish/Arab), and number of children. The contribution to inequality of gender, type of residential locale, and family status were less than 1 percent each. The central role of years of schooling in creating income inequality throws a spotlight on the importance of the education system in narrowing economic and social gaps. Nevertheless, Prof. Kimhi emphasizes that chasing after degrees and certificates will not solve the problem. According to him, there is a need to improve the work skills especially of those pupils who will not continue on to higher education, because these are the people at the highest risk of suffering from a lack of employment and low wages. The Taub Center for Social Policy Studies in Israel, headed by Professor Dan Ben-David, is an independent, non-partisan institution for socioeconomic research based in Jerusalem. The Center provides decisionmakers, as well as the public in general, with a big picture perspective on economic and social areas. The Center’s interdisciplinary Policy Programs – comprising leading academic and policy making experts – as well as the Center’s professional staff conduct research and provide policy recommendations in the key socioeconomic issues confronting the State. For addition information or to arrange an interview, please be in touch with Gal Ben Dor, Director of Marketing and Communications at the Taub Center: 050-5931577.